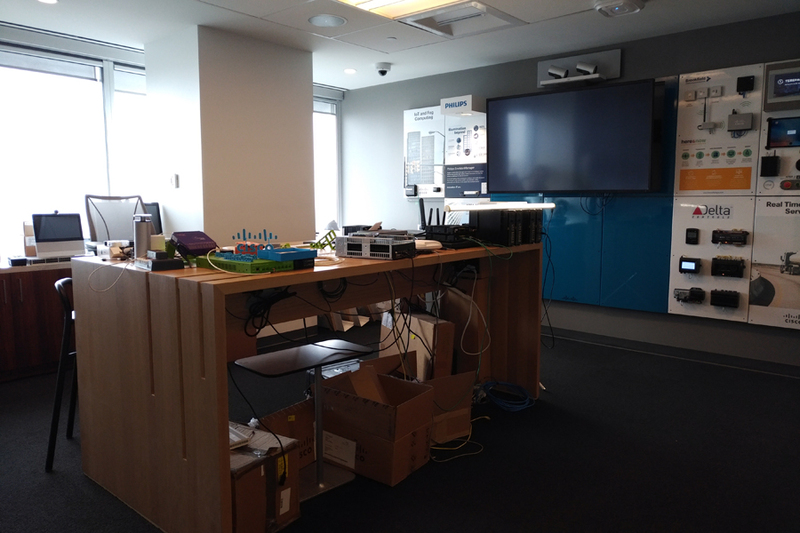 TORONTO – Cisco Systems Inc. recently invited us to visit its Toronto Innovation Centre, where the networking giant develops and showcases new technology for potential customers who might otherwise underestimate just how much Cisco and its partners can help them. 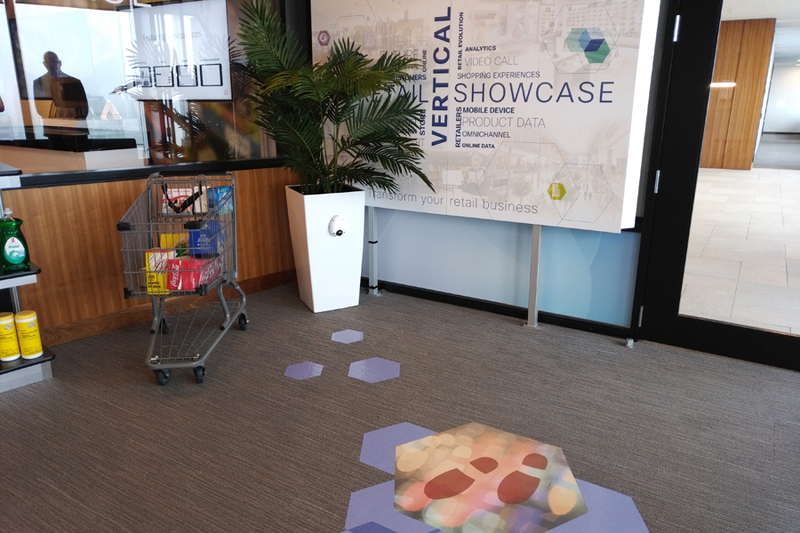 At the moment, the centre is outfitted with a series of digital solutions focused on the retail industry. He emphasizes, however, that the centre isn’t meant to showcase a “menu of solutions,” but rather spark discussions about “the art of the possible.” Join us for the tour. 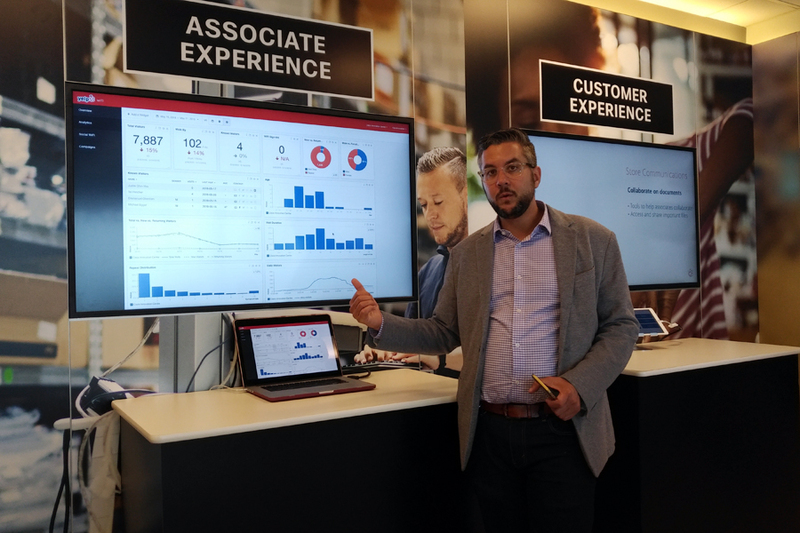 The first stop on our tour shows off a customer experience-enhancing feature of Cisco’s Meraki point-of-sale (POS) platform. In addition to being capable of scanning a box of Band-Aids or Minute Rice so that customers can pay for their items, the mobile device-based system allows customers to scan objects with their mobile devices to access complementary information such as recipes incorporating the rice or first aid tips. “It’s a new way for businesses to enrich their consumers’ interactions with their brand,” Cuervo says. Privacy advocates might blanch at this camera-based solution, developed at Cisco’s London innovation centre in partnership with U.K.-based Hoxton Analytics for an anonymous U.K. retailer, but Cuervo is quick to note that all information collected is anonymized. 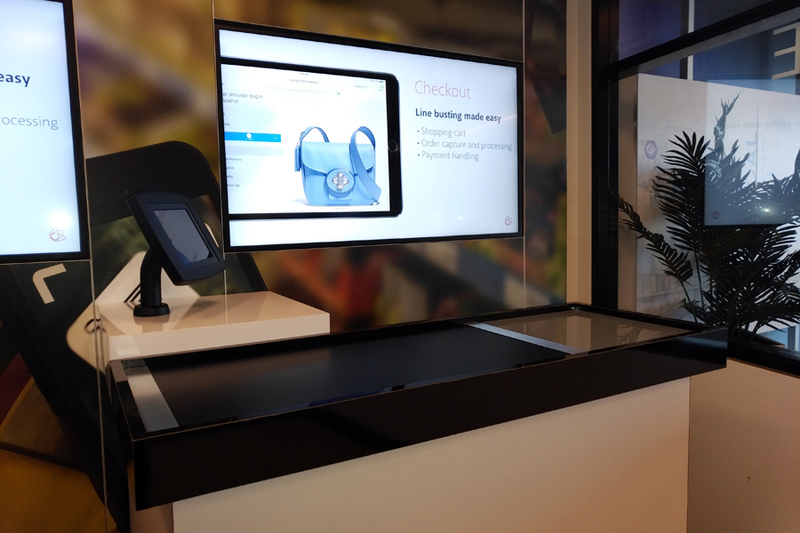 An iOS-based mobile platform that integrates with Meraki, Tulip Retail gives retail associates access to features such as “endless aisle,” which allows them to view and order inventory from multiple stores, and “line-busting checkout,” which allows associates to check customers out from wherever they happen to be standing. It also gives associates access to all available information about any product scanned with their mobile device. 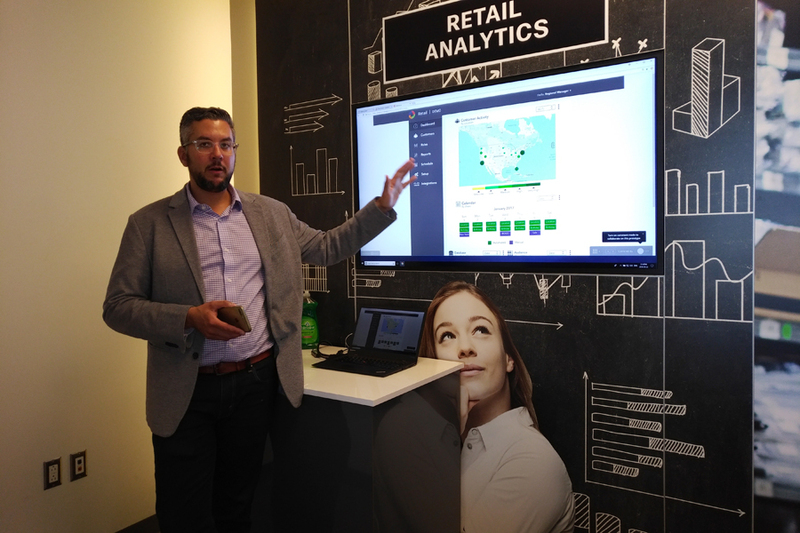 Phunware (you can watch a YouTube video demonstration here) uses geolocation to identify potential customers and entice them to visit a retailer’s store. In the YouTube video, the platform identifies a consenting user who has downloaded a department store’s app onto his smartphone, then sends him an offer to purchase hiking shoes at a 20 per cent discount. Interested, the user enters the store, his phone using indoor wayfinding technology to guide him to the shoe department. 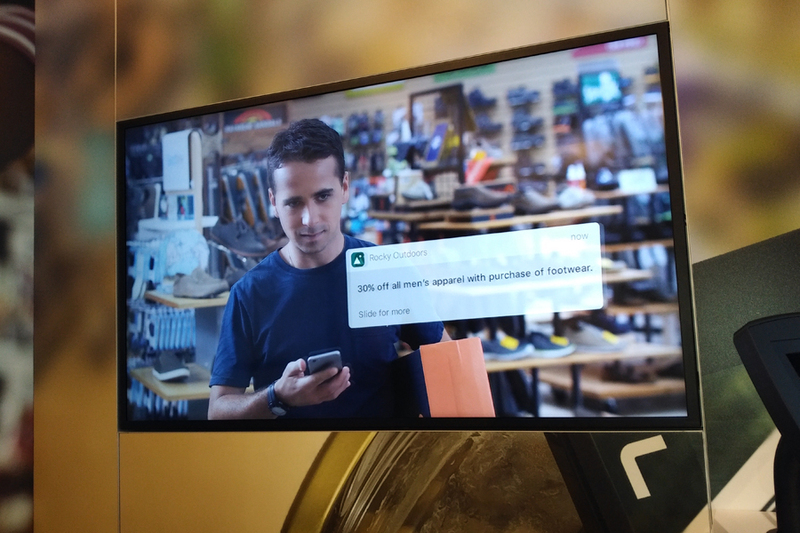 After he chooses a pair of shoes, the Phunware platform lets him know that he’ll receive a 30 per cent discount on any apparel purchased to go with them – and after his leaves, shoes and shirt in hand, it lets him know that he’ll receive an additional five per cent discount if he completes a short survey. According to Cuervo, while many retailers want customers to log into their WiFi networks thanks to the data generated, actually encouraging them to do so can be difficult: “It’s an ongoing struggle for retailers, because especially if you have a lot of data and you’re not travelling, what’s the value in actually connecting to in-store WiFi?” he says. Enter Yelp WiFi (formerly known as Turnstyle before its acquisition last April), which helps retailers use WiFi to gather customer insights, often by providing those customers with incentives to log into a retailer’s WiFi network in the first place. 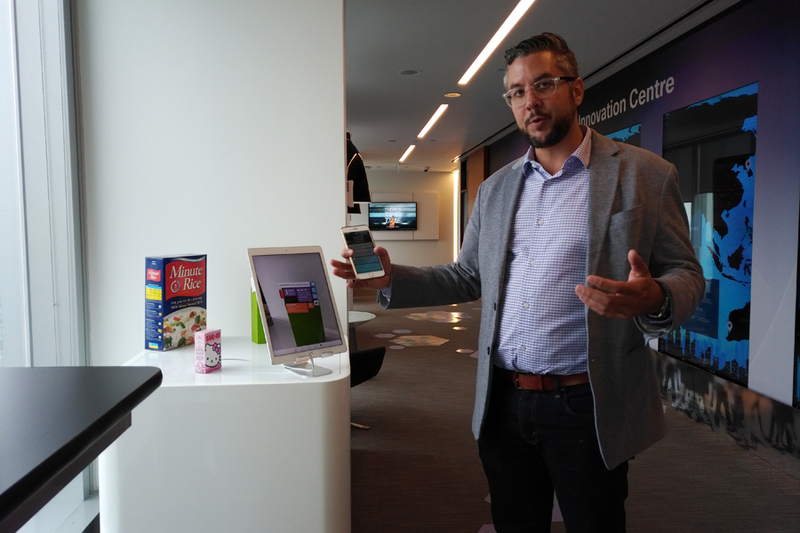 “You can tell customers that if they connect to WiFi they’ll get discounts, or a product,” Cuervo says. More importantly, the retailer can gather information about a customer – whether they’re a new or returning customer, male or female, age, length of visit, etc. – that will help them better target that person in the future. Qwasi is ideally suited to retailers with multiple locations seeking a way to keep track of information such as customer engagement and individual customer journeys. 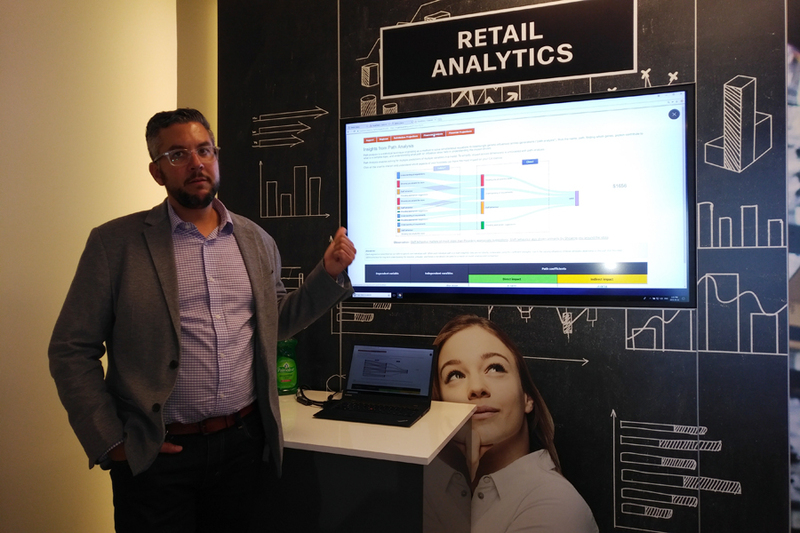 In the example shown here, Cuervo is able to access detailed reports from multiple stores that display the number of visitors in a single location on a particular day, or at a particular moment, based on the number of visitors with WiFi activated on their phones. 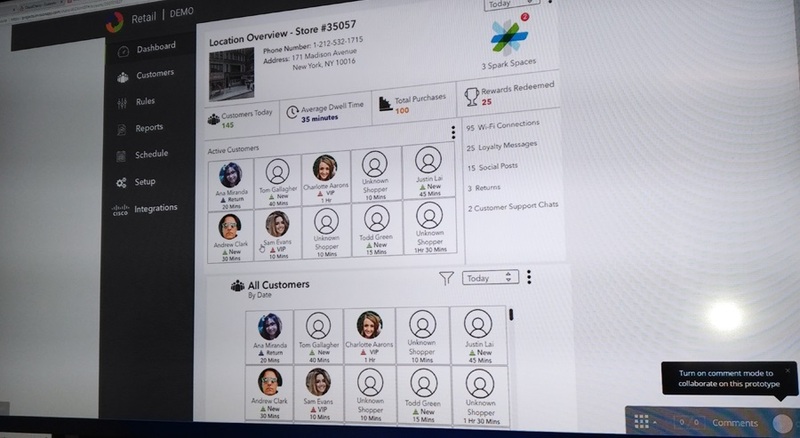 Drilling down into the previous example, in this screenshot Qwasi is sharing as much information as it can gather about the fictional store’s aforementioned 10 customers. One of those VIPs is shown here – the retailer has access to “Sam Evans'” birthday, rewards data, customer history, and contact information, with X-es identifying contact methods the retailer doesn’t have and exclamation points identifying contact methods they’re not authorized to use (email, in this case). Though everything showcased until now has been a partner product, the IBM Watson-powered Cloud Cherry is a Cisco investment. It provides retailers with a dashboard that gives them access to integrated POS data, rewards data, customer visits, social media sentiment, and unique features like one that lets customers know a product they almost but didn’t quite purchase online is available in-store. More importantly, it can use machine learning to analyze customer information for insights that help retailers improve their net promoter score (NPS), an index ranging from -100 to 100 that measures the willingness of customers to recommend a company’s products or services to others. This table, for example, suggests that the sample retailer can improve their NPS from 45 to 90 simply by ensuring that billing inquiries are resolved as quickly as possible. That concludes the retail-focused part of our tour, but Cuervo takes a moment to point out his company’s “Cisco Vision” technology, which retailers can use to not only adapt advertisements to a variety of screen sizes, from smartphones to the wall-sized units shown here, but respond to external stimuli. 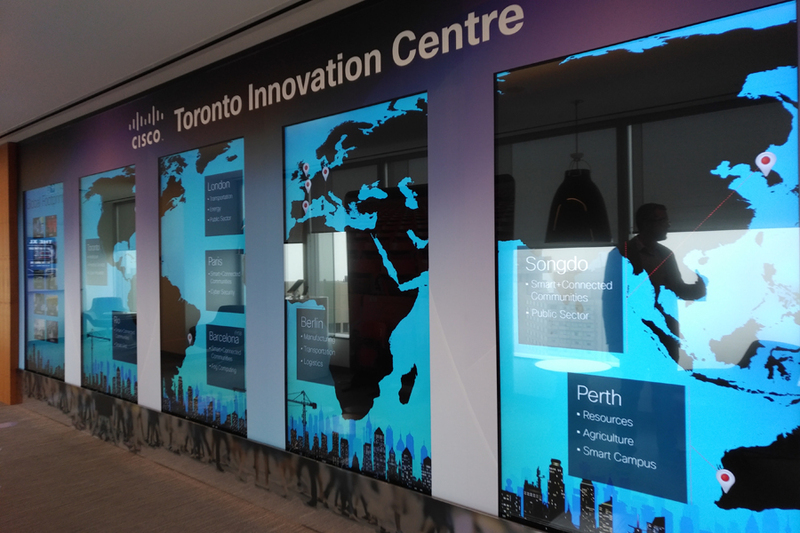 Normally these screens display a map showing off the locations of Cisco’s various Innovation Centres, but get close and they change. Here’s what the screen normally looks like. 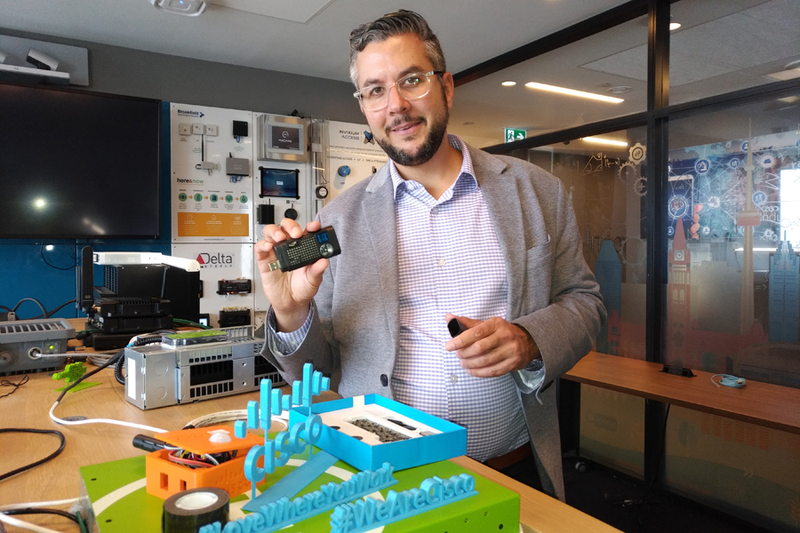 Cisco’s Toronto Innovation centre is currently one of 11 around the world – and, oddly enough, the only one in North America. Other innovation centres are located in Rio De Janeiro, Barcelona, Paris, Berlin, Manchester, London, Tokyo, Sydney, Perth, and Istanbul. 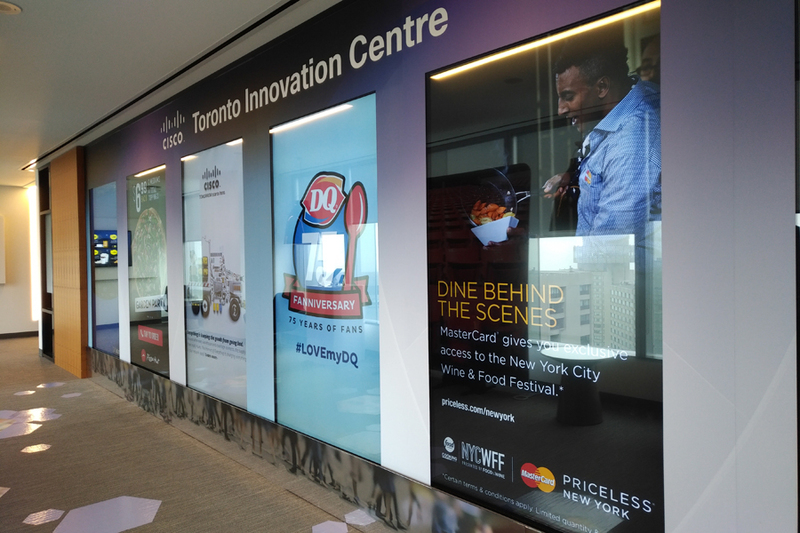 While each centre used to focus on specific verticals – Toronto, for example, originally focused on healthcare, financial services, and smart buildings – the centres’ mandates have expanded over the years to accommodate whatever innovations their researchers can dream up – including retail. …like this Deltavation ethernet-powered lamp that doubles as a retrofit fluourescent tube. You can actually remove a traditional fluourescent tube from its fixture and pop in this instead. 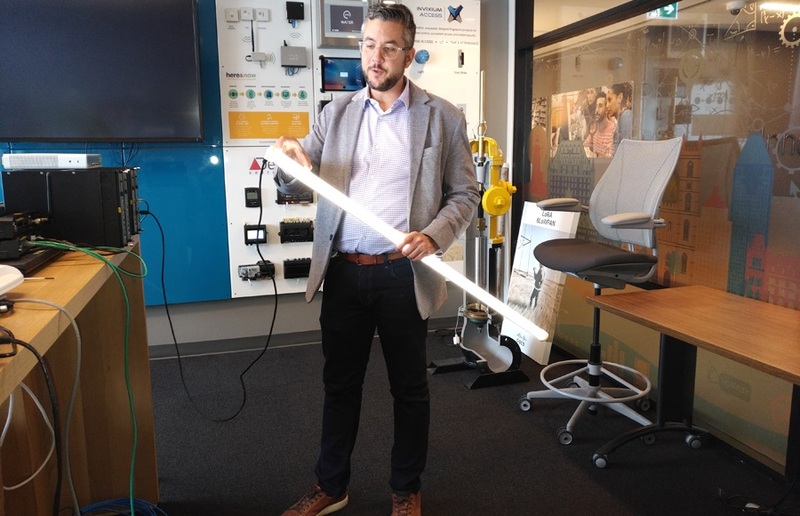 Not only is the lamp powered by ethernet, it includes a sensor packet that measures a room’s occupancy, humidity, temperature, and light levels, and adjusts the lamp’s brightness and intensity accordingly. Then there’s this prototype Li-Fi receiver, capable of generating wireless internet through light-emitting diode (LED) technology. 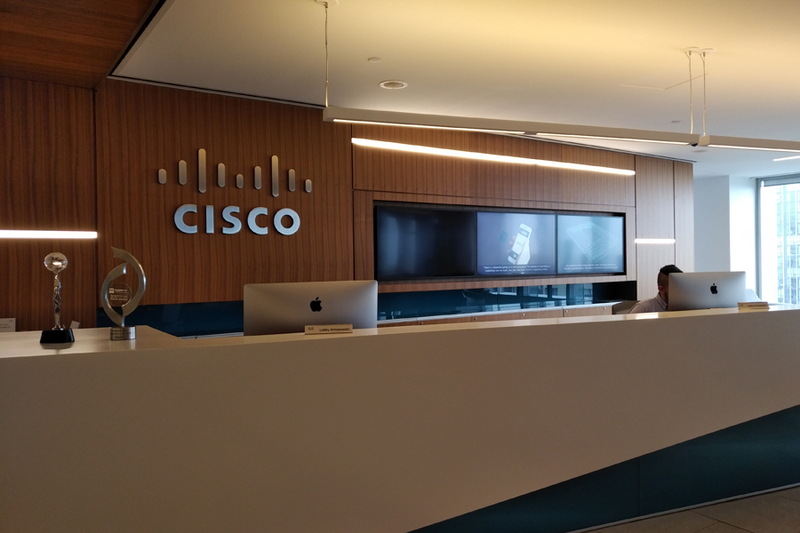 And yes, Cisco researchers have had the conversation you’re thinking.